The Printup Home - Room by Room - You are too late here: this is what we like to do when we can find it. When you enter the brick part from under the curved-roof porches from either door, you come into a huge formal hall with stairs leading to the second floor. To the east is a ~20x30’ 2 section living room, with a hand-hewn beam ceiling, Red Fir floors, and a fireplace. To the west is the formal dining room (or use it as a library) with a mock fireplace, a 1/2 bath, and also a large custom-built eat-in gourmet kitchen. It is fully applianced, everything new, everything high end. Upstairs, the huge hall continues and there is a “small” bedroom (12.5x18’) and two larger ones (each 17.5x18.5’), one with a mock fireplace and one with a real Rumsford fireplace with its original cover. A former fourth bedroom was turned into the pink marble bath and laundry facilities. The wooden part (which is vinyl sided) is smaller and more conventional. It may be the oldest portion of the home. It also has two doors, which enter from both a porch and a deck. Downstairs, there is a room recently used as a kitchen/dining room and a second room which had been used as a living room, plus a full bath. A stairway leads to 2 bedrooms above them (each 12x19’) which have cherry flooring. All rooms here (but the kitchen) have wood floors and crown molding. You can move between the brick and wooden sections of the home on both floors by doorways on each floor, ones which could be easily be closed off and locked. The front hall and stairs. Here's that window over the door. There is actually an interior pane as well. The living room is comprised of two parts and is ~20x30'. Original Rumford fireplace on second story, showing cut limestone side walls, painted brick red. 1) The home once had 4 fireplaces. Today, 2 are mock and the other two are original Rumford Fireplaces, which could be used if triple wall SS pipe were installed in the chimney. Count Rumford wrote in 1796 about physicist Benjamin Thompson's invention which narrowed the flue to increase draft and angled the sides to radiate more heat, resulting in a design that was considered state of the art until about 1850. Not only were these fireplaces more efficient, but they were virtually smoke-free. They are only rarely found in the US, and we have two of them! One fireplace still has the original decorative cover, which would have been installed during the warmer months. These covers are rarely found and, if found, never seem to be intact. All, that is, except for this one. 2) The bricks are installed in a very old pattern with every other brick at right angles. I am told this was an expensive way to build, even back then. A brick water ledge is also employed. 3) Arched bricks are over the windows. 4) The brick walls are from 16-24” thick. 5) All beams are hand-hewn and are pegged together. They are exposed in the living room. Additionally, the home is held together by a series of 1” steel threaded roads installed in multiple strategic places and spanning from one side to the other, yet hidden from sight. All are original. 6) Ceilings in the brick portion are 11’ upstairs and 10’4” and higher on the first floor of the brick portion of the home, 8' in the smaller wooden part. 7) Hallways are 8.5’ wide, feeling almost like long rooms. Quite impressive when you enter them. 8) Much of the woodwork is ornate for a Colonial, some in styles which are unique to this home. 9) In the eastern wing (which is probably equally old) is an area with 4 faux-painted doors and other woodwork. Very neat stuff to see. 10) A full walk-up attic features rare oval windows. We have found only 2 other homes in the county which have these. Here you can see that there were once 4 chimneys which served the home. They ran through the bricks in the walls, not along them, then slanted toward the center so they could exit nearer to the peak of the roof. In the attic, the wooden-pegged post and beam construction is easily seen. 12) 4300+ sq. ft. of living space. Because of the high ceilings, the cubic footage roughly equals that of a 5500 ft2 modern home. People walk in and are amazed at how large it is. It just does not look that large from the road. 13) Closets in each bedroom. They are double-deckers in the the main portion of the home. There is a large wardrobe which serves as a downstairs coat closet. There is a huge linen closet in the upstairs bath, with a sliding ladder to reach it. Ten closets total (13, if you count the double-deckers as 2). 14) Precisely cut limestone foundation with two stone interior walls, all mortar-filled between the blocks. One low room in the basement had been plastered, probably for cleanliness in cheese production. 15) 99%+ original brick, in very good condition for its age. 16) Long-lasting metal roofs, recently recoated. 17) Huge rooms. There are no small rooms. Nearly all of them have ceiling fans and lights, along with large windows. The ceiling fans make it easier to heat, keeping the warm air where you are, instead of near the ceiling. 18) Spectacular refinished pumpkin plank flooring in 6 areas. Refinished Red Fir, which looks just as nice, in 5 other areas. 19) 24 replacement windows, mostly quite large. All have tip-in cleaning and all but 5 are doubled-paned glass. Most are 6/6 design to match the remaining original windows. 20) 3 covered porches and a deck with period railings. Two of these have unique curved roofs with a medullary sun-ray design under each roof. This design mimics that found above the second story windows which are directly over each porch. 21) >95% original woodwork and <5% replica, some fairly elaborate for a home of this era. We'll bet you cannot tell which is which. 22) A series of 8 adjustable steel rods go through the house at various critical points and serve to strengthen it and keep it from spreading. We can see their ends on the outside, one of which uses a gear as a giant washer. Inside the home, except for the attic, the rods are hidden, quietly doing their work. In the kitchen are ceramlc tile countertops, floor and backsplash + high end appliances. Custom hickory cabinetry, all solid wood, no fake wood with a skin over it. Broom closet behind the penninsula. Dining Room (or use for a library or music room). Mock fireplace detail - dining room. Dining Room - detail of paneling below windows. Dining Room - more molding detail. Interior window, above 1/2 bath. That is a light shining, not a broken pane. Wooden part of home - second living room. Wooden part of home - second kitchen/dining room. The stairway, from the second floor. Fireplace detail in Bedroom #1. The three paneled insert is removable. There is a photo a distance above that shows it w/o the insert. Detail of mock fireplace in Bedroom #2. Two of the four faux-painted doors in the wooden section. Bedroom # 5 on floor plan. Bedroom #6 on floor plan. Keep in mind the premise under which everything was done: to have a gracious home, as original as possible, yet with amenities to complement modern times. I sincerely believe that old features, kept in fine condition, never go out of date. 1) Nearly all ceilings and a few walls were sheetrocked and elsewhere the plaster was patched - only where it was needed. 2) The two curved-roof porches/stoops were reconstructed, partly using period woodwork, and a sun-ray motif was employed to complement the medullary rays found in the windows above them. 3) A thorough rewiring was done, starting from the pole, a new 200 amp Square D entrance, and then throughout the home. No old wiring has been left. The 16-24” thick brick walls of the home made wiring especially tricky to do as plaster was put directly on the brick and we did not want it disturbed if at all possible. Every room has ample outlets, all done to code, and inspected. 4) Two new furnaces were installed in 2010, one gas and the other oil. Both are hot air (hot water would have ruined the baseboard moldings) with a programmable thermostat on the main furnace. This way the home heats more evenly (ie: hot air doesn't begin to cool down with overly long heat runs) and it can still be heated should one furnace ever fail or run out of fuel. 5) Specialty storm windows were made for the side windows in both halls, 2 replica thermopane windows were added here as well. Now, all but two windows in the home have been replaced by more modern ones. Nearly all the windows are large, which in turn imparts a light and airy feeling to the home. All rooms are well lit, day or night. 6) A new gourmet kitchen was installed. It features colonial-styled custom solid hickory cabinetry made to our specs by an Amish craftsman, with ceramic tile floors, countertops and backsplash. There is an over-sized peninsula, perfect for breakfasts or buffets. We are especially proud of this room. 7) High end appliances were installed in the main kitchen - Bosch dishwasher, a Bosch side-by-side refrigerator, and a Sharp built-in 5 burner range/oven/microwave with its own small computer, complete with its own recipes! The warranty on these will not start until the home is sold and the supplier has made an agreement with us which allows the buyer to switch them out should you have specific requirements not met by these appliances. 8) One bathroom was removed, another remodeled, and 2 new ones added. There is a pink marble bath in the largest of these, the one that used to be a bedroom. There are a total of 2 1/2 baths now. It's for a family on the go - no matter where you are in the home, you are never more than 25' from a bathroom. 9) Every appropriate surface (other than floors, see below) was painted, inside and out. Historical colors were used. A tiny exception is on the north side exterior where the original green paint was still in good shape. Amazing, 180 years old and still good! 10) Floors were sanded and polyurethaned in all rooms but the kitchens. They came out beautiful - 7 are Pumpkin Pine and 4 are Red Fir. 11) The original leaded leaded glass window in the lower hall was rebuilt by an Amish craftsman and reinstalled, along with a second curved glass, which serves as an interior storm. 12) Hand-hewn beams in the living rooms were exposed. 13) Large numbers of ceiling fans/lights and wall sconces were installed to complement the ones already there. This will lower heating bills by keeping warm air from gathering at the ceiling. Last winter, we burned only one tank of oil. Living there, you may expect to use more. 14) The plumbing was completely revamped, both supply and drain lines. No old plumbing is left. 15) Some landscaping was done, 75 lb of grass seed planted, and fill and shrubbery brought in where needed. The remains of a dilapidated barn are now gone. 16) Some of the sag of old age was alleviated - not enough to crack plaster - and the ground level floors were reinforced. The floors still retain the old character, meaning not they are absolutely level everywhere. But you no longer feel you walk up and downhill. 17) The roof was covered with a specialty thick and viscous paint-like product. 18) Extra insulation was added wherever we could find a spot and then 3” of rigid backed foam was put in the attic and the floor was reinstalled over it. 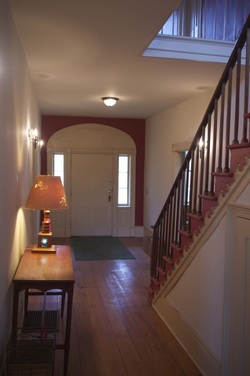 19) A stairway was added to the attic, which now allows one to walk up, like you could back when it was built. There is an “airlock” storage area (a former bathroom, if you must know) which avoids the chimney effect of sucking warm heated air from the home below up into the attic. 20) The cherry bannister and rail was repaired by a specialist. It was in surprising good condition when we started and only looks better now. You'll not see another like it, not anywhere. 21) Poor condition sliding glass doors were replaced by better quality ones. This is off the living room in the wooden section by the deck. 22) A rotted sill was replaced, along with nearly all the basement windows. Beams in one area were sistered in order to stiffen them. Cement footings were poured for the support posts to get them off the floor. 23) Specialty crown molding was added to the three rooms which needed it. 24) Bricks around the porches were water-sealed and the few cracks found elsewhere were filled and sealed with a masonry adhesive. 25) Where an old barn once stood is now a nicely shaded section of lawn. And the piles, years of junk, are finally gone. 26) The nearly 4’ wide front door was rebuilt. 27) The back deck had a period railing added. 28) Sump capacity for the basement was doubled and drainage pipes and crushed stone added so you will no longer get dirty or wet feet when you go down there, no matter how wet the weather. 29) New seamless rain gutters were recently installed, both sides of the home, with 4 downspouts. These carry a lifetime warranty. Walk-up attic in brick part exposes the wonderful old wooden-pegged hand-hewn beams. Basement. Check out that cut limestone foundation!